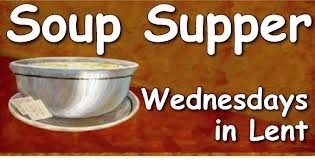 Please join us for our annual Lenten Soup Suppers in the Fellowship Hall starting Wednesday March 8th at 6:30 PM. These suppers will continue on Wednesdays at 6:30 PM on March 15th, March 22nd, March 29th, and April 5th. And don't forget the worship service that follows at 7:30 PM.